- Firstly, no rude, offensive, abusive posts. If you are caught posting things which are offensive in any way, your post will be edited and if you repeatedly post offensive things, you may face a ban from the Forums. - Secondly, no Spam. Posting again and again is not necessary. There is an edit button on all of your posts which you change click to change any of your messages or add to them. Use this if you forget something. You also shouldn't post just to get your post count up. If you are caught doing this, we will set your rank to a lower one which you will not be able to get off. Read below for more details on this. How do I become an Elite? 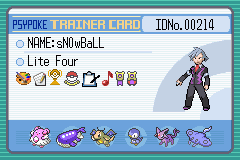 - The "Elite Four" title is reserved for the four webmasters of Psypoke: TonberryKing, Amphy, darkmind and Frost. It is unlikely that this will change in the near future, and thus nobody else will be given the "Elite Four" title. How do I become a Gym Leader? How do I get my post count up? - By posting CONSTRUCTIVE topics and replies. Spamming, or repeated posting is frowned upon. Post topics which are worthwhile and create discussion! What is the rank for 'A LOT' of posts? Are there any more ranks? - You will have to find out by getting there yourself. There's more ranks to achieve than the ones listed here. How do I get a Trainer Card for my signature? How do I get Ribbons/Medals/Badges for my Trainer Card? - Check out this page here: http://dynamic.gamespy.com/~psypoke/amphy/ribbons.htm Note: You must have a Trainer Card to get Ribbons etc added to your card. How do I contact an Elite/Admin? The easiest way is to send an email using the Contact Form. You can also post in the help forum as anybody is free to post there. Please do not send us Pokemon-related questions! This is a joint account between the four webmasters and is generally not used, so don't bother sending any messages to it, as a response is unlikely. Last edited by Amphy on Sat Oct 09, 2004 11:10 pm, edited 2 times in total. How do you create new teams of your own? No more teams can be made now, due to the fact that there was an overload of teams a while back and the mods don't want to clean all that spam so they forbode the creation of any more teams, though there were six at the time Nightmare and Midnight combine so now there are five. there should be a team for every type, is that a possibility at all in the future or is that completely out of the question? Last edited by Ferrari on Fri Oct 07, 2005 8:26 pm, edited 1 time in total. There is a team for every type. We havent yet finished sorting everything out for the teams. im sorry i should have been more clear, every type should have a single team by itself. total there would be 17 total teams. That would be too cluttered and spread out the team membership to just a few people per team. That's why we only have five teams and have each team cover 3 or 4 types, so we have 5 large teams rather than 17 small teams. What rank do I need to get a trainr card? Please read the thread before asking questions. It's what you're reading, silly. It's the TOPIC. ook thanks, im new to this psypoke thing. one more question someone said to come here to find out what psybucks are for, but what are they for? It's in another thread in this Announcements Section. Find the topic about the Psypoke Bank. Try exploring around, it isn't too hard to find out about Psybucks and all these features really. how do you change your signature or avatar(as you can see, mine isnt so great and i don't have an avatar)? Do the Impossible. See the Invisible. Touch the Untouchable. Break the Unbreakable. Click the Profile link at the top of the page, and scroll down to the signature and avatar sections. Edit as wanted. also, can you join teams, and if so, how? This topic has the answers to all of your questions. what time zone does psypokes go by, 'cause i go by PST, and psypokes is way ahead. also, what's the difference between the elite four and the lite four? If you're answering his second question, you couldn't be more wrong. The Elite Four are the admins for the site and forums, whereas the Lite Four are junior admins which can perform some basic admin functions on the forums, such as banning.